We know, we know—while actual sunshine continues to elude us, it’s still fecking hot and you need something to cool you down, STAT! Lucky for you and your overheated self, we’ve found the perfect antidote—frozen desserts. Whether it's a creamy soft serve or icy pop, frozen desserts are something you need to be familiar with this summer. Here are the best frozen desserts in Auckland, so you can stop stinging off your parent’s air con. 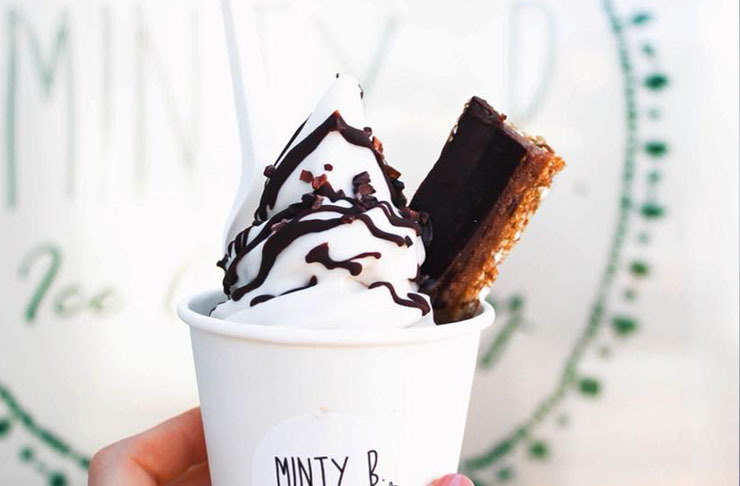 Meet Minty B, a restored vintage ‘70s caravan serving up tasty gluten and dairy-free soft serve and sorbets. They top their frozen delights with raw cookie dough, gooey caramel slice and drizzly chocolate sauce. Follow their Facebook page to find out where they’ll be parked up next. Ah, ice cream sandwiches. You’re a thing of our childhoods and we’re oh-so-glad that you’re back. For an ice cream sammie to rule them all, head to The Dairy in Ponsonby Central. These guys have mastered the art of sandwiching ice cream between two freshly baked cookies and topping it with fairy floss. Yes and yes. Shaved ice more your thing? Make a beeline for Chancery Square where Snowman Café will be there to cool you down with their delish range of shaved ice. Choose between cheesecake, green tea, Oreo, chocolate and mixed berry, or go for the more traditional approach with red bean. Whatever tickles your fancy—we know you’ll be hooked. If you’re yet to try a popolatos, hop to! These yummy icy creations are made by gelato truck Lalele Organic and they're the perfect antidote to the heat this summer. Made from locally sourced ingredients, popolatos (aka. addictive ice cream pops) are dairy-free and come in flavours like lemon sorbet, matcha green tea and coconut, strawberry, coconut and vanilla and avocado and French tarragon. They roll around the North Island during the summer, so keep eye on their Facebook page. Real fruit ice cream is always (ALWAYS!) a good idea—especially when the sun is beating down and you’re fairly sure you’re about to melt. 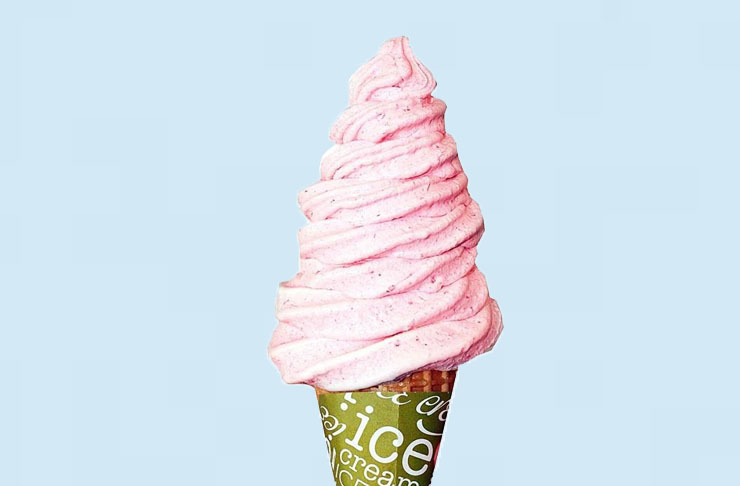 Auckland is dotted with a bunch of real fruit ice cream shops, waiting to put a stop to your heatstroke. Most are found on berry farms, where fruit is picked daily, and you can even pick it yourself. We’ve found the best of the best here. Save it, bookmark it, print it—whatever you do, just keep it handy this summer. It’s no secret that Auckland is obsessed with Miann. 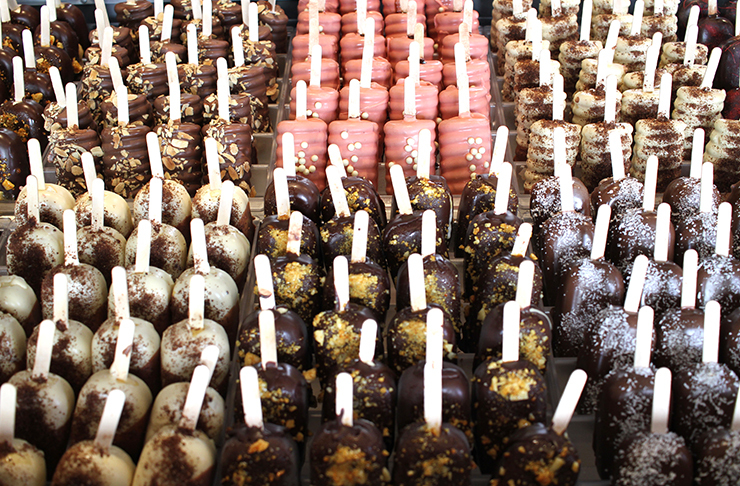 These CBD dessert havens are a sweet tooth’s dream, and home to all sorts of frozen desserts. We’re talking sundaes, gelato sticks (make it your NY resolution to try them all) and other refreshing dishes that look almost too beautiful to eat. Get there, ASAP. The Grounds is genius—genius, we tell you! The brainchild of chef extraordinaire Ben Bayly, this Henderson studio/playground/restaurant/café/family-friendly eatery is truly something special. One of our fave things about this spot is its love of the sweet stuff. From soft serve sundaes to handmade ice creams and the beloved ice cream sandwich, The Grounds has your frozen dessert cravings well and truly covered. Po’Brothers have put an Asian twist on the classic ice cream sammie and it is AWESOME. They take a deep-fried bao bun and stuff it with ice cream! No joke. There’s green tea matcha and sweet bean paste, cookies and cream with cookie crumble, chocolate fudge with chocolate drizzle, and the birthday cake bao—ice cream with cake and raspberry swirls, cake pieces and sprinkles. Drool! Giapo is hands down THE go-to joint for mind-blowing ice cream. Here, you get quantity AND quality. Giant scoops of the most divine gelato, heaved on to the most delectable of cones. 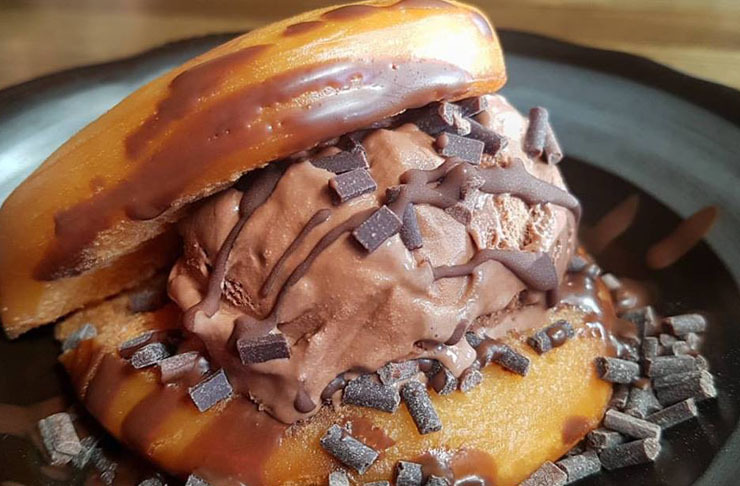 Having recently relocated to Gore Street, Giapo keeps surprising us with their newest flavours and innovations, featuring sweet but savory flavours like pani puri, poutine and fried pizza, among others.